Just email us or Call to place your order today. If we dont list what you want on our site, Go ahead and give us a call. We will try to locate your item. BEFORE ORDERING !! Please review our warranty information. 99% of our remotes come with easy programming instructions. We Offer FREE technical support to all customers that purchase a remote from our site! Your information is confidential and does not leave our premises in any shape or form. We carry the largest selection of remote controls / transmitter for car alarms, keyless entry, remote starters in the country. Brands like: Apache, AMX, DEI Replacements Remotes: Viper, Hornet, Python, Sidewinder, Clifford , Avital, Alpine, Astostart, Astroflex, Audiovox, Avital, Automate, Autopage, Autostart, Autocommand, Black Eagle, Black Widow, Bulldog, Carbine, Checkmate, Crimeguard, Crimestopper, Codealarm, Commander, code alarm, Chapman, Delta, Designtech, Excalibur, Exclusive, Executive, Hawk, Interceptor, Karr, Keymaster, K9, Federal, Freedom, Lojack, Magnadyne, Megatronix, Micro, Mirage, Omega, Patriot, Prestige, Prime, Pursuit, Automate, ezsdei, ezsde1, Your Valet, Equalizer, Pro Guard, Failsafe, Shark, Sherwood, Steal Stopper, Merlin, Hornet, Rampage, Rattler, Titan, TDS, Viper Ultra, Ungo, USA, Vesco, VPS, Whistler , Wasp Alarm, keyless, Pagers, pager, tracking. Also Factory OEM replacement remotes for Acura, Chevrolet, Chrysler, Ford, GM, GMC, Honda, Hyundai, Oldsmobile, Mazda, Nissan, Suzuki Pontiac, Prizm, Saturn, Suzuki, Subaru, Toyota, Volvo. All prices are subject to change. 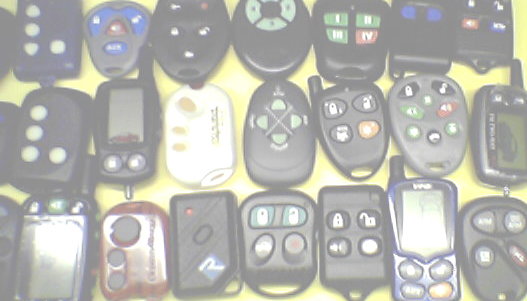 Replacement remotes may be different than the original design. In rare instances items showed in our website may be no longer made or available. Any item showing a zero price means that it has being discontinued or is no longer available. Make no mistake, we carry the largest selection of remote controls / transmitter for car alarms, keyless entry, remote starters in the country which come with a 1 year warranty, no one else has the customer service or warranty we offer our customers. We stock brands like: Apache, AMX, DEI Replacements Remotes: Viper, Hornet, Python, Sidewinder, Clifford , Avital, Alpine, Astostart, Astroflex, Audiovox, Avital, Automate, Autopage, Autostart, Autocommand, Black Eagle, Black Widow, Bulldog, Carbine, Checkmate, Crimeguard, Crimestopper, Codealarm, Commander, code alarm, Chapman, Delta, Designtech, Excalibur, Exclusive, Executive, Hawk, Interceptor, Karr, Keymaster, K9, Federal, Freedom, Lojack, Magnadyne, Megatronix, Micro, Mirage, Omega, Patriot, Prestige, Prime, Pursuit, Automate, ezsdei, ezsde1, Your Valet, Equalizer, Pro Guard, Failsafe, Shark, Sherwood, Steal Stopper, Merlin, Hornet, Rampage, Rattler, Titan, TDS, Viper Ultra, Ungo, USA, Vesco, VPS, Whistler , Wasp Alarm, keyless, Pagers, pager, tracking. Also Factory OEM replacement remotes for Acura, Chevrolet, Chrysler, Ford, GM, GMC, Honda, Hyundai, Oldsmobile, Mazda, Nissan, Suzuki Pontiac, Prizm, Saturn, Suzuki, Subaru, Toyota, Volvo.